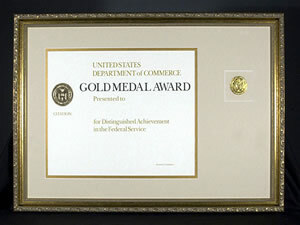 Oct. 10, 2004 — PMEL has won the Department of Commerce's Gold Medal, the highest honor given by the Department, for the development and successful transfer to operations of a real-time tsunami detection system(DART). NOAA Research’s Pacific Marine Environmental Laboratory (PMEL) and the National Data Buoy Center of NOAA’s National Weather Service have jointly transferred to operations a new moored buoy system, developed by PMEL, to provide accurate and timely warning information for tsunamis. An earthquake and subsequent tsunami on November 17, 2003 provided the opportunity to test the new system, which led to the timely cancellation of a tsunami warning and avoided an evacuation in Hawaii at a cost savings of $68M . Raising the funds to accomplish items 1-6.